The hospitable service will take care to make your visit to "Kartuli Sakhli" unforgettable. Old Georgian songs sung by our band make the atmosphere more attractive and nooker. "Kartuli Sakhli" is a place where you can experience the real Georgia - the place where the East meets the West. That is exactly what makes our traditions as unique as they are. 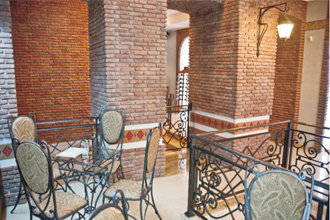 Traditional Georgian elements, red brick earthenware and the pictures of old Tiflis give create the classic Georgian aristocratic spirit. Here You'll experience an ancient Georgian hosting tradition which happens to be sacred for Georgians.